Now that you understand how to research your country assignment, we can start writing a research paper on your country assignment, which we call a Position Paper. But before we start the process of writing one, we first need to understand what a Position Paper is! Now pay close attention as we break down the reason for each section of a position paper, how it will help you in committee, and what questions you’ll need to make sure you answer to have a “great” position paper! When writing your Position Paper, it’s important to show that you have a general grasp of the issue you are discussing. If you walk into a Climate Change-focused committee with no idea what climate change is, you might be in a bit of trouble. That's where the topic background section becomes important, because you can use this as a chance to learn more about the issue and as a reference during committee! Sana’a, the capital of Yemen. Photo by Rod Waddington. Where does the topic take place? Who is involved? How many people does it affect? Where, and in what ways? When did this topic become an issue? 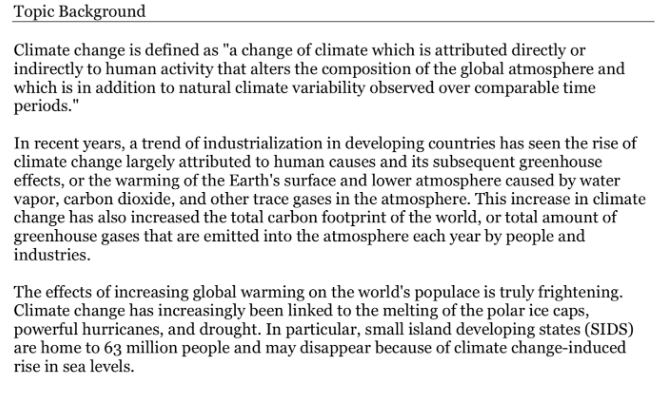 Take a look at the following example of a Topic Background section from a real Position Paper and try to find where it answers each of the indicated questions. In Model UN, it is extremely important to understand what solutions have already been attempted. Having this information on-hand in committee will give you more ammunition to use in your speeches and allow you to debate delegates that are pushing for old and unsuccessful solutions. It will also be important content for your Resolution (which we will explain more next week). UNHCR’s Zaatari Refugee Camp in Jordan. Photo by William Proby. What has the UN (e.g. your committee) tried to do on this topic? What are the most important resolutions and treaties on this topic? What are the two (or more) sides to this topic? Take a look at the following example of a Past International Actions section and try to find how they answered each question. Now that we’ve shown that we have a grasp on the topic and previous solutions, it’s time to focus on how our country assignment fits into the topic. As a delegate playing the role of a real country with real policies in committee, it is your responsibility to diplomatically represent that policy. That can only be done if you set yourself up for success by doing your research! Map of United Nations Member States votes on the UN Arms Trade Treaty, 2013. Image from Wikimedia Commons. How has this topic impacted your country? What has your country tried to do about this topic? Now look at the following example of a Country Policy section and find where each of the above questions are answered. When committee starts and you begin to discuss the issue at hand with other delegates, most of your conversation will revolve around solutions to the problem. That’s why the Possible Solutions section of a position paper is so crucial. If you take the time to research great solutions, then you’ll have them on-hand and ready to go when debate heats up or when you need to start writing your resolutions! US Air Force technicians destroying a seized firearms and munitions stockpile. Image from US Air Force Central Command. What is a possible solution that your country would support? Consider an existing solution that could be expanded with more support or funding. How would this solution be funded? Look through the example of a Possible Solutions section provided below and find where each of the above questions are answered. The final portion of any great position paper contains all of the sources you used to fill out the previous 4 sections of the paper. If you find yourself debating someone about how to finance a proposed solution, listing the source you used is a great way to add ethos, or credibility, to your position. This portion also lets the chair know that you’ve researched a wide variety of sources and didn’t just rely on 1 or 2 websites. At BDMUNC we only require at a minimum the links used to arrive at your research for the conference, but citation rules vary by conference and school. We’ll except any professional citation format, so long as delegates cite their sources. Please note: you’re welcome to research online and share what you’ve learned from your research, but you can never copy the words of another author outside of a direct quote- this is considered plagiarism, and will result in disqualification from BDMUNC and a report being sent to your school. One resource we like to use to screen for plagiarism is the Pensters Plagiarism Screening Tool- teachers, feel free to use this resource or any other plagiarism screening tool like TurnItIn.com to check your students’ work. Notice how the example below has 14 different websites listed. This shows us that the author spent a lot of time researching, which is something a good chair will take note of. When making your sources section, make sure you include every source you used in your research, and that you’re focusing on credible sources, for example: UN or government websites, credible NGOs or educational institutions, and think-tanks. Avoid blogs and Wikipedia! Now that you have a working understanding of the structure and importance of a position paper, it’s your turn to write one! Download this Position Paper Outline and fill it out with the details relevant to your particular topic and country assignment. The research you did last week will be especially helpful in creating this outline! If you run into questions or difficulties while writing the Position Paper Outline, please refer back to research strategies from last week's lesson. Remember to use the Power Search method!